For vehicles relying completely on automation, see Uncrewed vehicle. "intelligent car" redirects here. For the European Commission policy, see Intelligent Car Initiative. Vehicular automation involves the use of mechatronics, artificial intelligence, and multi-agent system to assist a vehicle's operator. These features and the vehicles employing them may be labeled as intelligent or smart. A vehicle using automation for difficult tasks, especially navigation, may be referred to as semi-autonomous. A vehicle relying solely on automation is consequently referred to as robotic or autonomous. After the invention of the integrated circuit, the sophistication of automation technology increased. Manufacturers and researchers subsequently added a variety of automated functions to automobiles and other vehicles. Level 1: Driver assistance - The vehicle can control either steering or speed autonomously in specific circumstances to assist the driver. Level 2: Partial automation - The vehicle can control both steering and speed autonomously in specific circumstances to assist the driver. Level 3: Conditional automation - The vehicle can control both steering and speed autonomously under normal environmental conditions, but requires driver oversight. Level 4: High automation - The vehicle can complete a travel autonomously under normal environmental conditions, not requiring driver oversight. Level 5: Full autonomy - The vehicle can complete a travel autonomously in any environmental conditions. Ground vehicles employing automation and teleoperation include shipyard gantries, mining trucks, bomb-disposal robots, robotic insects, and driverless tractors. There are a lot of autonomous and semi-autonomous ground vehicles being made for the purpose of transporting passengers. One such example is the free-ranging on grid (FROG) technology which consists of autonomous vehicles, a magnetic track and a supervisory system. The FROG system is deployed for industrial purposes in factory sites and has been in used since 1999 on the ParkShuttle, a PRT-style public transport system in the city of Capelle aan den IJssel to connect the Rivium business park with the neighboring city of Rotterdam (where the route terminates at the Kralingse Zoom metro station). The system experienced a crash in 2005 that proved to be caused by a human error. Anti-lock braking system (ABS) (also Emergency Braking Assistance (EBA)), often coupled with Electronic brake force distribution (EBD), which prevents the brakes from locking and losing traction while braking. This shortens stopping distances in most cases and, more importantly, allows the driver to steer the vehicle while braking. Research is ongoing and prototypes of autonomous ground vehicles exist. Extensive automation for cars focuses on either introducing robotic cars or modifying modern car designs to be semi-autonomous. Semi-autonomous designs could be implemented sooner as they rely less on technology that is still at the forefront of research. An example is the dual mode monorail. Groups such as RUF (Denmark) and TriTrack (USA) are working on projects consisting of specialized private cars that are driven manually on normal roads but also that dock onto a monorail/guideway along which they are driven autonomously. As a method of automating cars without extensively modifying the cars as much as a robotic car, Automated highway systems (AHS) aims to construct lanes on highways that would be equipped with, for example, magnets to guide the vehicles. Automation vehicles have auto-brakes named as Auto Vehicles Braking System (AVBS). Highway computers would manage the traffic and direct the cars to avoid crashes. Singapore also announced a set of provisional national standards on January 31, 2019, to guide the autonomous vehicle industry. The standards, known as Technical Reference 68 (TR68), will promote the safe deployment of fully driverless vehicles in Singapore, according to a joint press release by Enterprise Singapore (ESG), Land Transport Authority (LTA), Standards Development Organisation and Singapore Standards Council (SSC). Following recent developments in autonomous cars, shared autonomous vehicles are now able to run in ordinary traffic without the need for embedded guidance markers. So far the focus has been on low speed, 20 miles per hour (32 km/h), with short, fixed routes for the "last mile" of journeys. This means issues of collision avoidance and safety are significantly less challenging than those for automated cars, which seek to match the performance of conventional vehicles. Aside from 2getthere ("ParkShuttle"), three companies - Ligier ("Easymile EZ10"), Navya ("ARMA" & "Autonom Cab") and RDM Group ("LUTZ Pathfinder") - are manufacturing and actively testing such vehicles. Two other companies have produced prototypes, Local Motors ("Olli") and the GATEway project. Beside these efforts, Apple is reportedly developing an autonomous shuttle, based on a vehicle from an existing automaker, to transfer employees between its offices in Palo Alto and Infinite Loop, Cupertino. The project called "PAIL", after its destinations, was revealed in August 2017 when Apple announced it had abandoned development of autonomous cars. A large number of trials have been conducted since 2016, with most involving only one vehicle on a short route for a short period of time and with an on board conductor. The purpose of the trials has been to both provide technical data and to familiarize the public with the driver less technology. In July 2018, the Chinese search engine Baidu unveiled its autonomous bus "Apolong", manufactured by Kinglong and developed by a consortium of 40 multinational companies including BMW, Baidu and Intel. It is expected to be the first mass produced autonomous bus. EasyMile EasyMile has long term trials at Wageningen University and Lausanne as well as short trials in Darwin, Dubai, Helsinki, San Sebastian, Sophia Antipolis, Bordeaux, Tapei and a tour of five US cities. In December 2017 a trial began in Denver running at 5 miles per hour (8.0 km/h) on a dedicated stretch of road. Navya Navya claimed in May 2017 to have carried almost 150,000 passengers across Europe with trials in Sion, Cologne, Lyon, Doha, Bordeaux and the nuclear power plant at Civaux as well as Las Vegas and Perth. Other trials are scheduled for University of Michigan in the fall of 2017 and La Trobe University. Next-Future The ten passenger (six seated), 12 miles per hour (19 km/h), autonomous pods which are capable of joining to form a bus, were demonstrated at the World Government Summit in Dubai in February 2018. The demonstration was a collaboration with between Next-Future and Dubai's Roads and Transport Authority and the vehicles are under consideration for deployment there. Olli The Olli was tested in Washington D.C. at the end of 2016 and was due to be trialed in Las Vegas and Miami. RDM Group In October 2017 RDM Group began a trial service with four seat vehicles between Trumpington Park and Ride and Cambridge railway station along the guided busway, for possible use as an after hours service once the regular bus service has stopped each day. If the trial is successful a ten-seat vehicle would be used in routine service. Parkshuttle Trials are underway prior to a planned 2020 deployment in Dubai. A successful climate test was completed in November 2017. Trials are also planned for 2getthere's third generation Parkshuttle in Singapore. Texas A&M In August 2017 a driverless four seat shuttle was trialed at Texas A&M university as part of its "Transportation Technology Initiative" in a project run by academics and students on the campus. They hope to have 15 shuttles working on the campus in 2017. Apollo (Apolong) - Baidu / Kinglong In July 2018, a driverless eight seater shuttle bus was trialed at the 2018 Shanghai expo after tests in Xiamen and Chongqing cities as part of Project Apollo, a mass produced autonomous vehicle project launched by Baidu. The consortium that developed Apolong (English name: Apollo) autonomous bus included open source technology developed by 10,000 developers and a consortium of 40 multinational companies including Mercedes Benz, XTE, Baidu, Intel, Softbank, Kinglong and BMW. Transurban On 20 March 2018 the Government of New South Wales and Transurban announced they will begin testing driverless technology on the M2 Hills Motorway in Sydney NSW Australia. Considered a "mapping trial" because the cars will be driven by a human at all times. In January 2017 it was announced the ParkShuttle system in the Netherlands will be renewed and expanded including extending the route network beyond the exclusive right of way so vehicles will run in mixed traffic on ordinary roads. The upgrade will occur after 2018 when the current operating concession expires. Parkshuttle plans deployment of 25 vehicles in 2020 that will perform fully autonomous shuttle services to and from Bluewaters Island in Dubai. A successful climate test was completed in November 2017. In December 2016 the Jacksonville Transportation Authority has announced its intention to replace, within five years, the Jacksonville Skyway monorail with driverless vehicles that would run on the existing elevated superstructure as well as continue onto ordinary roads. The plan is to keep the current system running while preparing for the new technology. Several self-balancing autonomous motorcycles were demonstrated in 2017 and 2018 from BMW, Honda and Yamaha. Autonomous buses are a reality as well as self driving cars and trucks. They are started to be used in Stockholm. China has also a small fleet of self-driving public buses in the tech district of Shenzhen, Guangdong. The concept for autonomous vehicles has been applied for commercial uses, such as autonomous or nearly autonomous trucks. Companies such as Suncor Energy, a Canadian energy company, and Rio Tinto Group were among the first to replace human-operated trucks with driverless commercial trucks run by computers. In April 2016, trucks from major manufacturers including Volvo and the Daimler Company completed a week of autonomous driving across Europe, organized by the Dutch, in an effort to get self-driving trucks on the road. With developments in self-driving trucks progressing, U.S. self-driving truck sales is expected to reach 60,000 by 2035 according to a report released by IHS Inc. in June 2016. As reported in June 1995 in Popular Science Magazine, self-driving trucks were being developed for combat convoys, whereby only the lead truck would be driven by a human and the following trucks would rely on satellite, an inertial guidance system and ground-speed sensors. Caterpillar Inc. made early developments in 2013 with the Robotics Institute at Carnegie Mellon University to improve efficiency and reduce cost at various mining and construction sites. In Europe, the Safe Road Trains for the Environment is such an approach. From PWC's Strategy& Report, self driving trucks will be the source of a lot of concern around how this technology will impact around 3 million truck drivers in the US, as well as 4 million employees in support of the trucking economy in gas stations, restaurants, bars and hotels. At the same time, some companies like Starsky, are aiming for Level 3 Autonomy, which would see the driver playing a control role around the truck's environment. The company's project, remote truck driving, would give truck drivers a greater work-life balance, enabling them to avoid long periods away from their home. This would however provoke a potential mismatch between the driver's skills with the technological redefinition of the job. Companies that buy driverless trucks could massively cut down on costs: human drivers will no longer be required, companies' liabilities due to truck accidents will diminish, and productivity will increase (as the driverless truck doesn't need to rest). The usage of self driving trucks will go hand in hand with the use of real-time data to optimize both efficiency and productivity of the service delivered, as a way to tackle traffic congestion for example. Driverless trucks could enable new business models that would see deliveries shift from day time to night time or time slots in which traffic is less heavily dense. In March 2018, Waymo, the automated vehicle company spun off from Google parent company Alphabet Inc., announced it was applying its technology to semi trucks. In the announcement, Waymo noted it would be using automated trucks to move freight related to Google's data centers in the Atlanta, GA area. The trucks will be manned and operated on public roads. In October 2016, Uber completed the first driverless operation of an automated truck on public roads, delivering a trailer of Budweiser beer from Fort Collins, CO to Colorado Springs. The run was completed at night on Interstate 25 after extensive testing and system improvements in cooperation with the Colorado State Police. The truck had a human in the cab but not sitting in the driver's seat, while the Colorado State Police provided a rolling closure of the highway. At the time, Uber's automated truck was based primarily on technology developed by Otto, which Uber acquired in August 2016. In March 2018, Uber announced it was using its automated trucks to deliver freight in Arizona, while also leveraging the UberFreight app to find and dispatch loads. In February 2018, Embark Trucks announced it had completed the first cross-country trip of an automated semi, driving 2,400 miles from Los Angeles, CA to Jacksonville, FL on Interstate 10. This followed a November 2017 announcement that it had partnered with Electrolux and Ryder to test its automated truck by moving Frigidaire refrigerators from El Paso, TX to Palm Springs, CA. In November 2017 Tesla, Inc., owned by Elon Musk, revealed a prototype of the Tesla Semi and announced that it would go into production. This long-haul, electric semi-truck can drive itself and move in "platoons" that automatically follow a lead vehicle. It was disclosed in August 2017 that it sought permission to test the vehicles in Nevada. In 2017, Starsky Robotics unveiled its technology that allows to make trucks autonomous. Unlike its bigger competitors in this industry that aims to tackle Level 4 and 5 Autonomy, Starsky Robotics is aiming at producing Level 3 Autonomy trucks, in which the human drivers should be prepared to respond to a "request to intervene" in case anything goes wrong. A few experiments have been undergone to develop delivery drones for various industries, including packages and food. Innovation is driving this very young market and sees traditional transportation companies compete with start-ups, governments and technological companies like Amazon, for whom delivery is central to its growth strategy. However, even if technology seems to allow for those solutions to function correctly as various tests of various companies show, the main throwback to the market launch and use of such drones is inevitably the legislation in place and regulatory agencies have to decide on the framework they wish to take to draft regulation. This process is in different phases across the world as each country will tackle the topic independently. For example, Iceland's government and departments of transport, aviation, police have already started issuing licenses for drone operations. It has a permissive approach and together with Costa Rica, Italy, the UAE, Sweden and Norway, has a fairly unrestricted legislation on commercial drone use. Those countries are characterized by a body of regulation that may give operational guidelines or require licensing, registration and insurance. On the other side, other countries have decided to ban, either directly (outright ban) or indirectly (effective ban), the use of commercial drones. The RAND Corporation thus makes the difference between countries forbidding drones and those that have a formal process for commercial drone licensing, but requirements are either impossible to meet or licenses do not appear to have been approved. However, most countries seem to be struggling on the integration of drones for commercial uses into their aviation regulatory frameworks. Thus, constraints are placed on the use of those drones such as that they must be operating within the visual line of sight (VLOS) of the pilot and thus limiting their potential range. This would be the case of the Netherlands and Belgium. Most countries do let pilot operate outside the VLOS but is subject to restrictions and pilot ratings, which would be the case of the US. The general trend is that legislation is moving fast and laws are constantly being reevaluated. Countries are moving towards a more permissive approach but the industry still lacks infrastructures to ensure the success of such a transition. To provide safety and efficiency, specialized training courses, pilot exams (type of UAV and flying conditions) as well as liability management measures regarding insurances have to be developed. There is a sense of urgency that breathes from this innovation as competition is high and companies lobby to integrate them rapidly in their products and services offerings. Since June 2017, the US Senate legislation reauthorized the Federal Aviation Administration and the Department of Transportation to create a carrier certificate allowing for package deliveries by drones. The concept for autonomous vehicles has also been applied for commercial uses, like for autonomous trains. First self-driving train in UK was launched in London Thameslink route. An examples of an automated trains is the Docklands Light Railway in London. An automated guided vehicle or automatic guided vehicle (AGV) is a mobile robot that follows markers or wires in the floor, or uses vision, magnets, or lasers for navigation. They are most often used in industrial applications to move materials around a manufacturing facility or warehouse. Application of the automatic guided vehicle has broadened during the late 20th century. Aircraft has received much attention for automation, especially for navigation. A system capable of autonomously navigating a vehicle (especially aircraft) is known as autopilot. Autonomous boats can provide security, do research, or perform hazardous or repetitive tasks (such as guiding a large ship into a harbor or transporting cargo). Underwater vehicles have been a focus for automation for tasks such as pipeline inspection and underwater mapping. 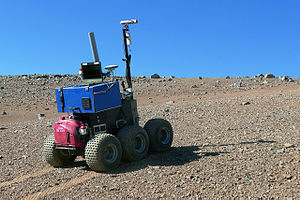 ^ "Self-steering Mars Rover tested at ESO's Paranal Observatory". ESO Announcement. Retrieved 21 June 2012. ^ "Driverless robot buses crash". Wolfstad.com. 2005-12-06. Retrieved 2011-11-20. ^ "Driverless robot buses crash, Part 2". Wolfstad.com. 2005-12-17. Retrieved 2011-11-20. ^ "Vauxhall Vectra | Auto Express News | News". Auto Express. 2005-11-29. Retrieved 2011-11-20. ^ "Nissan | News Press Release". Nissan-global.com. 2006-03-15. Archived from the original on 2011-10-27. Retrieved 2011-11-20. ^ "Singapore's driverless vehicle ambitions reach next milestone with new national standards". Channel NewsAsia. Retrieved 2019-02-02. ^ "Navya unveils autonomous taxi". November 9, 2017. Retrieved 13 November 2017. ^ Wakabayashi, Daisuke (August 22, 2017). "Apple Scales Back Its Ambitions for a Self-Driving Car". The New York Times. Retrieved 5 September 2017. ^ "Driverless Bus TESTING ROUTE NOTICE". Northern Territory Government. September 5, 2017. Retrieved 12 September 2017. ^ "Society Driverless bus test in Taipei gets positive feedback". Focus Taiwan News Channel. August 5, 2017. Retrieved 1 September 2017. ^ "Driverless bus makes a stop in Atlanta while on cross-country tour". Atlanta Business Chronicle. January 26, 2017. Retrieved 1 September 2017. ^ "Denver's first driverless shuttle hits the test track, avoids tumbleweed before possible 2018 launch". December 4, 2017. Retrieved 7 December 2017. ^ Scott, Mark (May 28, 2017). "The Future of European Transit: Driverless and Utilitarian". The New York Times. Retrieved 8 September 2017. ^ "Las Vegas launches driverless shuttle bus test run on public roads". January 12, 2017. Retrieved 1 September 2017. ^ "Driverless bus takes to the road in Perth". The Australian. September 1, 2016. Retrieved 1 September 2017. ^ "Navya driverless shuttles to begin ferrying University of Michigan students this fall". Tech Crunch. June 21, 2017. Retrieved 1 September 2017. ^ "Autonomous shuttle bus developed in Melbourne set for trial at La Trobe University". Herald Sun. June 26, 2017. Retrieved 1 September 2017. ^ "Dubai tests the world's first autonomous mobility pods". 15 February 2018. Retrieved 25 February 2018. ^ "Washington D.C. residents can ride in this adorable driverless shuttle starting this summer". Business Insider. June 16, 2016. Retrieved 5 October 2017. ^ "Trials begin of driverless pods that could be used alongside night buses in Cambridge (but they'll only travel at 15mph)". October 24, 2017. Retrieved 25 October 2017. ^ "Driverless robot 'pods' take to the Cambridge guided busway". October 18, 2017. Retrieved 24 October 2017. ^ Thomas, Daniel (5 April 2017). "Driverless shuttle bus to be tested by public in London". BBC News. Retrieved 1 September 2017. ^ "Oxford Engineering to bring driverless shuttles to London". University of Oxford. Retrieved 1 September 2017. ^ a b "Driverless Dubai buses pass strict climate tests ahead of 2020 launch". November 4, 2017. Retrieved 7 December 2017. ^ "SMRT and 2getthere partner to bring automated vehicles to Singapore". Channel NewsAsia. April 20, 2016. Retrieved September 1, 2017. ^ "HITCHING A RIDE Project looks to bring autonomous shuttles to Texas A&M campus". The Eagle. August 24, 2017. Retrieved 5 September 2017. ^ "Autonomous Shuttle". Unmanned Systems Lab Texas A&M University. Retrieved 5 September 2017. ^ McLean, Asha (21 March 2018). "NSW starts driverless car trial as Uber pauses". ZDNet. Retrieved 23 July 2018. ^ "Introducing the world's first completely unattended public autonomous vehicle". Euro Transport Magazine. 20 February 2017. Retrieved 1 September 2017. ^ Kitchen, Sebastian (December 8, 2016). "JTA recommends replacing Skyway with driverless vehicles, creating corridor from Riverside to EverBank Field". Florida Times-Union. Retrieved 25 January 2017. ^ "Self-driving shuttle buses hit the streets of Stockholm". New Atlas. ^ "Self-driving buses are being tested in China and they're the largest of their kind yet". Mashable. ^ "Suncor Seeks Cost Cutting With Robot Trucks in Oil-Sands Mine". Bloomberg-.com. 2013-10-13. Retrieved 2016-06-14. ^ "HS Clarifies Autonomous Vehicle Sales Forecast – Expects 21 Million Sales Globally in the Year 2035 and Nearly 76 Million Sold Globally Through 2035". ihs-.com. 2016-06-09. Retrieved 2016-06-14. ^ Nelson, Ray (June 1995). "Leave The Driving To Us". Popular Science. p. 26. ^ Gingrich, Newt (7 October 2014). Breakout: Pioneers of the Future, Prison Guards of the Past, and the Epic Battle That Will Decide America's Fate. Regnery Publishing. p. 114. ISBN 978-1621572817. ^ "Transportation invests for a new future: Automation is rapidly accelerating and disrupting the industry" (PDF). ^ "Waymo's self-driving trucks will start delivering freight in Atlanta". The Verge. Retrieved 2018-03-13. ^ "Uber's Self-Driving Truck Makes Its First Delivery: 50,000 Budweisers". WIRED. Retrieved 2018-03-13. ^ "Colorado officer recounts how Otto's autonomous beer delivery became a reality". Fleet Owner. 2018-03-09. Retrieved 2018-03-13. ^ Dillet, Romain. "Uber acquires Otto to lead Uber's self-driving car effort". TechCrunch. Retrieved 2018-03-13. ^ McFarland, Matt (2018-03-26). "First self-drive train launched on mainline track". Telegraph. ^ Kolodny, Lora (2018-02-06). "A self-driving truck just drove from Los Angeles to Jacksonville". CNBC. Retrieved 2018-03-13. ^ "A Self-Driving Truck Might Deliver Your Next Refrigerator". WIRED. Retrieved 2018-03-13. ^ "Exclusive: Tesla developing self-driving tech for semi-truck, wants to test in Nevada". Reuters. August 10, 2017. Retrieved 8 September 2017. ^ "International Commercial Drone Regulation and Drone Delivery Services" (PDF). RAND. ^ "Bill S. 1405" (PDF). ^ Topham, Gwyn (2018-03-26). "First self-driving train launches on London Thameslink route". The Guardian.